Are you and your kids all fired up about things that begin with f? Well, here’s the worksheet for you! It has six things that begin with the letter f, including a fire! 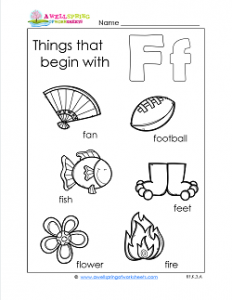 Those things are: feet, fish, fan, flower, football , and like I mentioned before, fire. Just print out this page and plan on having a good time saying these words a few times over, putting special emphasis on the letter f. Go ahead and have your kids circle the letter f in each word and color the pictures and the letters.